Download - how the wines of each vintage are tasting now! 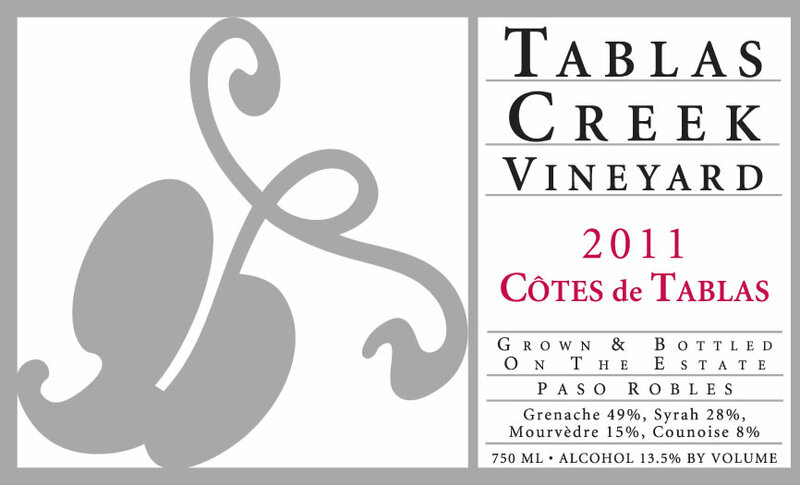 The Tablas Creek Vineyard Côtes de Tablas is a blend of four estate-grown Rhône varietals: Grenache, Syrah, Counoise and Mourvèdre. Like most wines of the Southern Rhône, it is a blend of varietals, featuring the fruit and spice of Grenache balanced by the spice and mineral of Syrah, the appealing briary wildness of Counoise, and the structure of Mourvèdre. The 2011 Côtes de Tablas shows a deep, powerful nose of soy, licorice and black cherry, with an appealing sweet spice note emerging with air. The mouth is rich with plum, cherry, leather, balsamic and crushed rock balanced by fresh acidity and characteristic chalky Grenache tannins on the lingering, spicy finish. Hold for six months, then drink for the next decade or more. We shared updated tasting notes from a November 2018 tasting on the Tablas Creek blog. The grapes for our Côtes de Tablas were grown on our 120-acre certified organic estate vineyard. The 2011 vintage was our second consecutive winter with healthy rainfall, but yields were dramatically reduced by two nights of frost on April 8th and 9th, impacting early-sprouting grapes like Grenache and Syrah but largely sparing the late-sprouting Mourvedre. Despite the low crop loads, ripening was slow due to a very cool summer, and harvest roughly three weeks later than normal, beginning in mid-September and not concluding until mid-November. Warm, sunny weather during harvest allowed the later-ripening varieties to reach full maturity. The long hangtime and low yields combined to produce fruit with notable richness balanced by higher than usual acidity, all at low alcohol levels. Syrah harvest began September 30th, followed by Grenache on October 4th, Counoise on October 12th and Mourvèdre on October 18th. The last pick of all four grapes came November 9th. All varietals were fermented in a mix of stainless steel and wooden upright fermenters with the use of native yeasts. After pressing, the wines were racked, blended, aged for a year in 1200-gallon French oak foudres, and then bottled in March 2013. The wines underwent only a light filtration before bottling. © Copyright 2019 by Tablas Creek Vineyard.